Danielle Blum and Billy Carrington are pictured with High School Counselor Andy Palzkill at the Kiwanis Student of the Month luncheon. 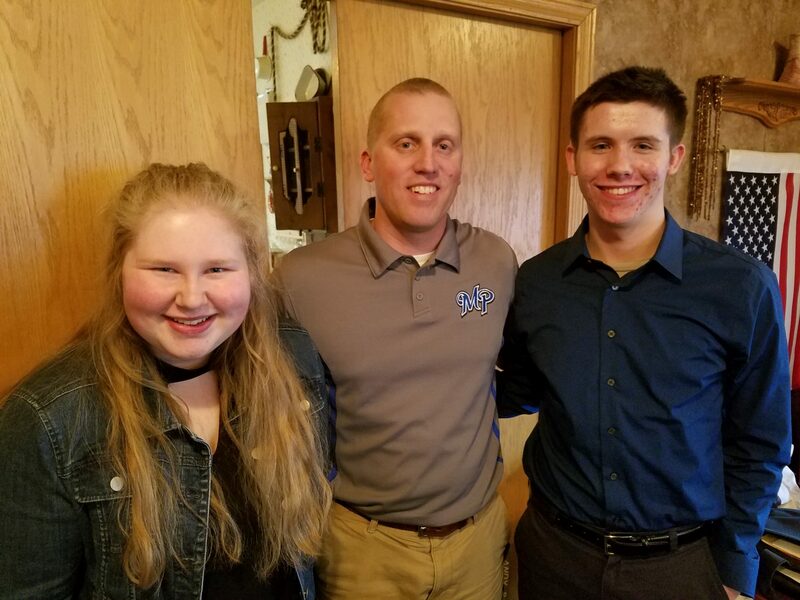 The Mineral Point Kiwanis Club honored its February Students of the Month at its meeting Tuesday, February 20 at the Pointer Cafe. Danielle has been raised in Mineral Point her whole life. She is the daughter of Debbie and Jerry. She is the oldest of two children. Anthony, her younger brother, is in the 5th grade. She is a member of Future Business Leaders of America, Skills USA, musical theatre, band, National Honor Society, forensics, and student council. She is a member of the Pleasant View 4-H Club. The past year, she has served as her club’s president. Danielle is also a hard worker. She maintains her grades and activities while having a part-time job. She works at Point Foods. She also spends a lot of time helping her mom at Blooming Basket in Dodgeville. Danielle enjoys reading and watching movies. She is also the first chair clarinet in the school’s band. Danielle enjoys singing and acting. She has been part of the musical theatre program for four years. Many of you may have seen her on stage in the musical Shrek. She played Donkey. Danielle also enjoys to listen to all different types of music. She plans on attending a four-year college. She is unsure of where she is going, but Danielle will be majoring in Microbiology. Danielle has been influenced by Mr. Tom Steger and Mr. Matt Austin. They both have helped her choose her future career and have influenced her to become better than she ever could imagine. Danielle would like to thank everyone for making this day so special. She would like to thank all of her supporters. Danielle would like to congratulate Billy on his accomplishments. “Danielle has been a wonderful leader for the Mineral Point High School Band. Serving as drum major, she expected nothing but the best out of her peers. She had no problem telling them that something wasn’t up to par, and would make them do it again! In class, Danielle always wants to get right to business and works to get things better. She has been a tremendous asset to the Mineral Point band and choir program and she will be missed upon graduation.” ~ Matt Nevers, Band Teacher. “Danielle Blum has inspired me with her determination and work ethic. I have watched her use these traits throughout her middle and high school experiences to grow her academic skills and become a top student. I’m going to miss her next year!” ~ Kris McCoy, Middle/High School Librarian. “Danielle Blum was a terrific asset to the High School Choir last year. She represented our program at both the District and State Solo & Ensemble Competitions – for which she earned A-Ratings, at the pre-show performance for the Nutcracker Ballet, and the SWAL Honors Choir Festival. She was also nominated for the UW-Milwaukee Vocal Arts Festival. Danielle earned multiple choral awards last year, including Best Junior Alto, Best Attitude in Alto Section, and Best Musicianship in Alto Section. Her leadership skills, self-motivation, and friendly personality were a joy to work with, were ideal examples for her classmates, and are dearly missed this year. Danielle also served as a terrific role-model for the High School Musical Theatre program, for both shows during her upperclassmen years. This year, she was cast as Donkey, a lead role, in Shrek the Musical, for which she earned awards for Best Humor Delivery and Most Charismatic & Dedicated. For her supporting role of Grandma in last year’s show, The Addams’ Family, she earned awards for Best Wit Delivery and Best Personality Onstage. Throughout both production runs, Danielle always embodied professionalism in her ability to prepare her roles and take criticism, timeliness, and communication. She surpassed expectations in her interpretation of her characters and challenged her peers to do the same on a constant basis. She was always kind and humorous during rehearsals, flexible with changes, and demonstrated leadership daily.” ~ Ashley McHugh, Choir Teacher. “Danielle Blum has always had a smile that brightens a room! She was, and is, a super friendly gal. Her hardworking attitude will take her far! She is sure to do many wonderful things to make others happy! Congratulations, Danielle!” ~ Jill McGuire, Kindergarten Teacher. “Danielle is a fun, creative, and energetic young lady. Her involvement in band and choir and extracurricular involvement in the school’s musicals provide her an opportunity to showcase her creative talents. Danielle has a strong work ethic and determination. She is passionate and outspoken, both of which are qualities that, when used with skill and wisdom, can set one apart from the crowd and will serve her well in the future. I have truly enjoyed getting to know Danielle as a valued member of FBLA. She has been a great helper and honorary officer. I wish her the best of luck!” ~ Kip Bakken, Business Teacher. Billy is the son of Pat and Paula Carrington and brother of Taylor Berg. Pat is an electrician and Paula works at Charter Communications in Fitchburg. Billy enjoys going to school and strives to do his best in the classroom. Some clubs that he has been involved in during high school include Math Team, Key Club, Skills USA, and National Honor Society. He currently works at the Walker House where he has worked part-time since freshman year. There he helps the chefs cook food, waits tables, and cleans up after events. His favorite classes in school are Chemistry, SIG II, and AP Language because he has fun doing experiments, learning about laws, and writing. Outside of the classroom, music means everything to Billy. He learned to play the drums from his dad and produces music. When he is not working or doing homework, he spends most of his free time listening to music–his favorites are dance, rock, and R&B. After high school, Billy will be attending UW-Oshkosh where he plans to study recording technology and marketing. After college, he plans to pursue a career as a producer and sound engineer. Billy would like to thank the community and the teachers of Mineral Point who have always encouraged him to become the best student he can and instilled in him a good work ethic. Billy would also like to congratulate Danielle on her achievements. “Billy Carrington continuously impresses me with his politeness and ability to stay on task when chaos surrounds him. These skills will take him far!” ~ Kris McCoy, Middle/High School Librarian. “Billy has always had a quiet demeanor. He always perseveres through challenging work. I hope you have great success in life, Billy! Good luck next year!” ~ Jill McGuire, Kindergarten Teacher. “Billy is a very respectful and hard-working young man.” ~ Amanda Ingwell, Elementary Instructional Assistant.